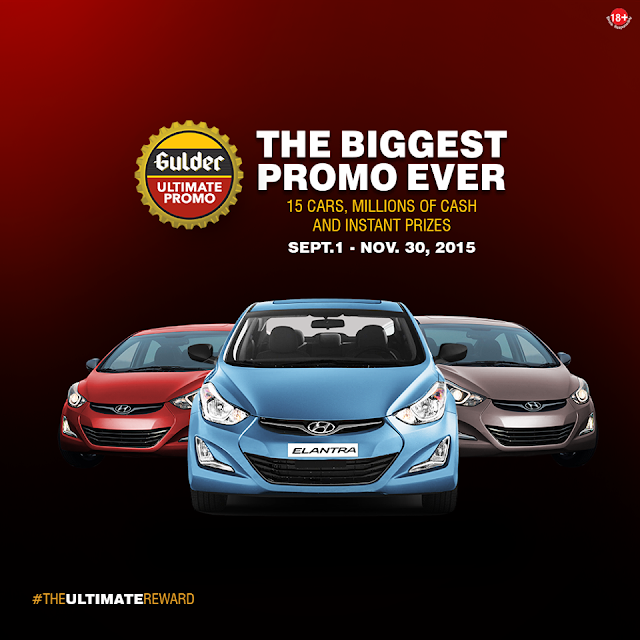 GULDER ULTIMATE PROMO #THEULTIMATEREWARD. WIN 15 CARS, MILLIONS OF CASH PRIZES AND INSTANT PRIZES. Gulder has just unveiled the biggest promotion the nation has ever seen. Call it ‪#‎THEULTIMATEREWARD‬. 1. Buy a bottle of Gulder and check under the crown cork for a unique raffle code. 4. All winners will be contacted before prizes will be delivered to their addresses. 1. Buy Gulder and check under the crown cork for amazing instant prizes. (Airtime or Free drinks only). 2. Visit any of the Gulder Ultimate Promo Redemption Centres to Redeem your Prize. Promo Runs from September 1st to November 30th, 2015. Instructions on how to participate, claim, prizes and acknowledgement form for the promotion form part of these ‘Terms and Conditions’. Participation in this offer is deemed acceptance of these Terms and Conditions. Gulder Ultimate Promo is open only to Consumers aged 18 years or over. Employees (and their immediate families) of Nigerian Breweries PLC (“NB Plc”), partner agencies (Insight Communications, Oracle Event Agency, Starcom Media, Mediacraft, I-Concept, Generation E, Bytesize), and suppliers associated with this promotion are ineligible to claim or participate in the experiential platform. ‘Gulder Ultimate Search’ Finalists or ‘Title Holders’ are ineligible to claim or participate in the experiential platform. Offer commences on 1st of September 2015 and closes at 11.59pm Local Time on 30th of November, 2015 ("Offer Period"). To be eligible to participate, eligible claimants must purchase a bottle of Gulder from any bar in the country during the Offer Period. Free Drinks will be liquid content only. Holders of the ‘Free drinks’ crown corks are expected to visit any of the 2,500 ‘Retailer-Managed Redemption Centres’ nationwide to redeem their free drinks. To complement the ‘Retailer-Managed Redemption Centres’, 178 selected NB Plc Super/Key Distributors (“S/KD”) will serve as alternative Redemption Centres. There will be a stationed Clerk at these Centres that will attend to free drink winners. The Redemption Centres (Retailer-Managed or S/KD) will display large banners with the PROMOTION TITLE + ‘REDEMPTION CENTRE’ clearly written. The Airtime crown corks are clearly marked ‘AIRTIME’ and will contain alpha-numeric codes. The airtime will be restricted to major telecommunication network and subscribers, i.e. GLO, Airtel, Etisalat and MTN. Incomplete, indecipherable or illegible entries shall be invalid. These second category of crown corks contain unique alpha-numeric codes and are clearly marked RAFFLE TICKET. Holders of these raffle ticket crown corks are expected to send their unique alpha-numeric codes with their basic biodata (in the order Unique Code, Name, Age and State) to the Brand’s designated shortcode (20388) to enter for a national raffle draw. The national raffle draws will hold at different times within the offer period, i.e. The draws will be aired on selected national and terrestrial TV stations. Winners will be contacted immediately after the draws by the Gulder Brand’s representative. They will be advised to check the newspapers, brand website (www.gulder-nigeria), social media page (www.facebook.com/GulderNigeria) or other public information channel to validate their winnings. Winners are also expected to keep their winning crown cork to validate winnings. The tangible prizes will be delivered to the door steps of the various winners on a weekly basis. The delivery process will be managed by JUMIA, an Online Retail Outlet. Winners must present valid identification and the crown corks to redeem their prizes. Participants cannot win more than 1 (one) grand prize. Cash prize winners will be directed to the Closest NB PLC office to redeem their prizes. They are also expected to come with a valid identification and the winning crown cork. The third category of crown cork will be marked ‘ULTIMATE CHASE’ and this is an experiential platform designed to engage holders of the crown cork with the brand’s core values and the opportunity to be the ‘Ultimate Man’ in their own rights, i.e. making them the man they are meant to be. Holders of these crown corks are expected to report to the 8 designated venues with 6 Ultimate Chase Crown Cork for an opportunity to be part of a chase. Prospective Participant must not have or be treated for any cardiovascular or physical disability involving flexibility or stretching problem. Winners are not expected to share their Bank details or ATM card number with anybody. Prize winning crown corks by any other person, other than the selected winner will not be accepted. NB Plc reserves the right, at any time, to verify the validity of claims and claimants (including a claimant's identity, age and place of residence) and to disqualify any claimant who submits a claim that is not in accordance with these Terms and Conditions or who tampers with the claim process. Failure by NB Plc to enforce any of its rights at any stage does not constitute a waiver of those rights. If any gift is unavailable, NB Plc, in its discretion, reserves the right to substitute the gift with a gift to the equal value and/or specification. Redeemed prizes are not transferable or exchangeable and cannot be taken as cash. If the raffle draw mechanics, including SMS/text entries and raffle draw process is interfered with in any way or is not capable of being conducted as reasonably anticipated due to any reason beyond the reasonable control of NB Plc, NB Plc reserves the right, in its sole discretion, to the fullest extent permitted by law (a) to disqualify any claimant; or (b) to modify, suspend, terminate or cancel the offer, as appropriate. Except for any liability that cannot be excluded by law, NB Plc (including its officers, employees and agents) excludes all liability (including negligence), for any personal injury; or any loss or damage (including loss of opportunity); whether direct, indirect, special or consequential, arising in any way out of the promotion, including, but not limited to, where arising out of the following: (a) any theft, unauthorized access or third party interference; (b) any entry that is lost, altered, damaged or misdirected (whether or not after their receipt by the NB Plc) due to any reason beyond the reasonable control of the Promoter; (c) any variation in gift value to that identified in all communication materials; (d) any tax liability incurred by a winner; or (e) use of a prizes. The Promoter collects personal information in order to conduct the promotion and may, for this purpose, disclose such information to third parties, including but not limited to agents, contractors, service providers, offer suppliers and as required, to Nigerian regulatory authorities. NB Plc may, for an indefinite period, unless otherwise advised, use the information for promotional, marketing, publicity, research and profiling purposes, including sending electronic messages or telephoning the claimant. *This is Excellent Excellent Excellent Promo. The raffle ticket SMS number 20388 is not going through. Please new SMS number.